Product information "MCO Home - Electrical Heating Thermostat with humidity sensor Version 2"
The MCOEMH7-EH2 thermostat is a device for room temperature control, equipped with Z-Wave wireless technology. It is applied to control electrical heating systems such as heating cable, electro-thermal film, heating actuator, electrical globe valve etc. The wall thermostat MCOEMH7-EH2 requires a static installation with mains power. Thanks to its modern design with capacitive glass touch panel it is particularly suited for visible installation in living areas. 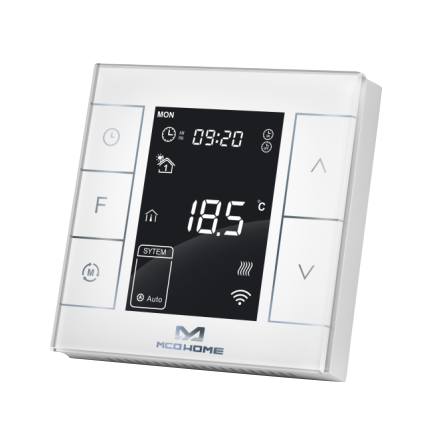 With the modern designed glass touch thermostats by MCO you can control various heating and cooling systems – e.g. heating cable, heating film, water valve, electrical valve, boiler, fan coil, solar energy controller, heat pump, ventilation system etc. Related links to "MCO Home - Electrical Heating Thermostat with humidity sensor Version 2"